A good friend of mine, Paddy Belton, decided to host a quiet dinner party last weekend. Having been ripped off by some bandits over renting a small Edwardian pile in Hamstead (complete with imaginary sauna and swimming pool) it was kindly hosted by friends in Blackheath of the good ship RMS Carpathia. 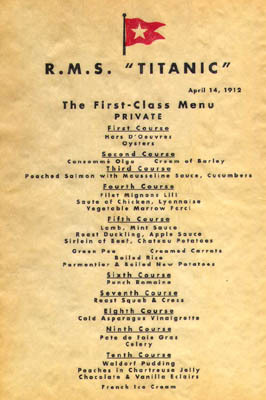 The menu followed exactly the ten course offerings of the First Class Dining Room on the White Star Line’s flagship for the fateful night of the 14th of April 1912. The menu is reproduced below. Highlights included Roast Squab (think baby widgeon) the much anticipated Asparagus course, and enough booze… well to sink a ship. The tragic events of the night (1513 people died if you need reminding) have become the stuff of legend, and accounts and myth surrounds the ship. Little wonder however that so many of the first class passengers did not survive… I could hardly move! The RMS Carpathia, the ship that picked up survivors of the Titanic disaster, also suffered a disastrous fate. When the ship docked in New York thousands came to welcome her, and the Captain was given the Congressional Gold Medal. I think Roger and Chloe who offered their flat at the last minute deserve no lesser recognition after Paddy’s misfortune with the pirates… anyhow Carpathia was used to transfer American troops to Europe during the war, but was torpedoed in the Celtic Sea by U-Boat 55. As Carpathia began to sink by the bow, Captain William Prothero gave the orders to abandon ship. All 57 passengers and 218 surviving crew members boarded the lifeboats… The Submarine surfaced and fired a third torpedo into the ship and was approaching the lifeboats when the terror of the seas, HMS Snowdrop (where do they get these names? ), arrived on the scene and drove away the submarine with gunfire then picked up the survivors from the Carpathia. 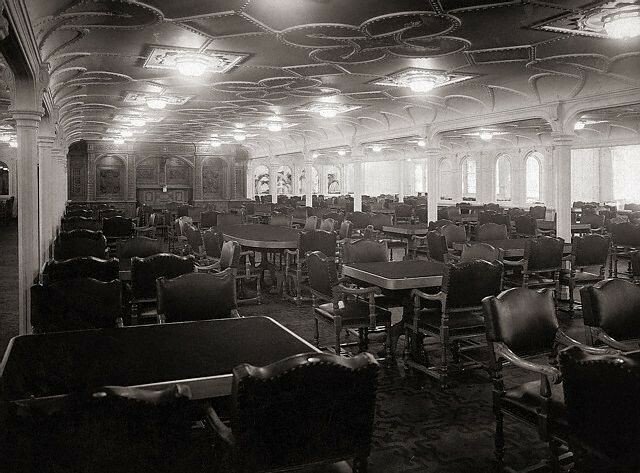 One interesting (if you find these things interesting) snippet of information, the original First Class Dining Room of the Titanic’s sister ship, the RMS Olympic, can still be found. 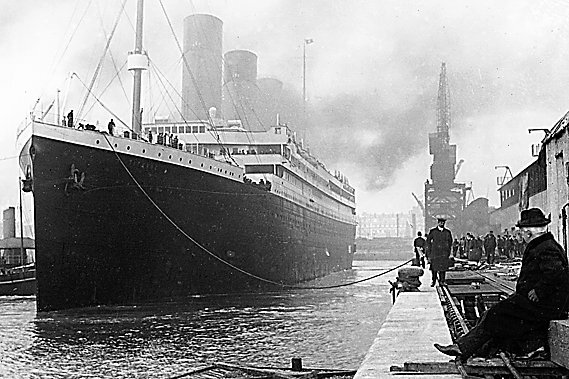 (The photo of the room here is actually of the Olympic as I can’t find one of the Titanic.) After a long and eventful life on the seas as the largest passenger liner in the world, Olympic was requisitioned during World War I and served as a troop ship under the delightfully named Captain Herbert James Haddock. When Cunard merged with White Star Line she was decommissioned in 1935 and sold as scrap. Her fixtures and fittings were auctioned off before she was scrapped at T.W. Ward’s Yard in Inverkeihing, and I am reliably informed that most of the First Class Lounge, along with cutlery and crockery and part of the Grand Staircase, can be found in the White Swan Hotel in Alnwick. Confirmation of this, or volunteers for a loon trip ‘tup north are welcome! This made me snicker for a protracted time.